Many people are using RK3066 mini PCs because they currently offer the best performance to cost ratio, but until now they were mainly limited to Android Jelly Bean, although there was some preliminary port of Ubuntu available for the devices. 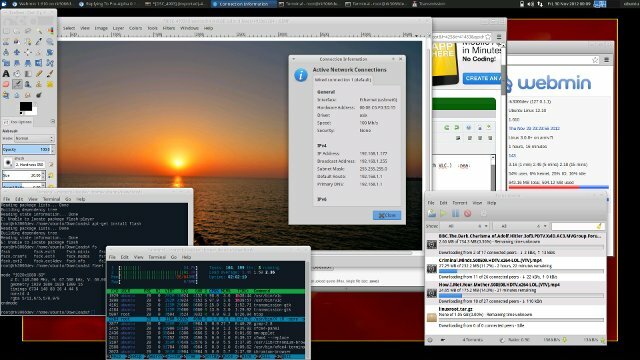 Now, this preliminary port has become a specific Linux distribution for Rockchip RK3066 PCs-on-a-stick called PicUntu, which is based on Ubuntu 12.10, and can optionally support Xfce or Gnome desktop environments. This distribution is known to work on UG802 and MK808, but should also work on some other RK3066 mini PCs such as iMito MX1. The latest version is Picuntu 0.9 RC 2.2, and features such as WiFi, Ethernet, HDMI audio, USB webcam are known to work, What you won’t get, however, is hardware video decoding and GPU support since Rockchip does not provide the relevant binary files for Linux, but this does not seem to stop the developers from trying. But even without GPU support, people are happily running PicUntu at 1920×1080 in their mini PC, and report it to be pretty smooth. It’s also possible to play SD videos with software decoding. You’ll also be able to select extra packages such as Apache, LibreOffice, Xfce, Gnome, Java, and many more. I’ve also noticed the recent addition of PicuntuInstaller.apk, an Android app (Alpha version) that lets you install PicUbuntu from Android. You can follow the discussions on Slatedroid and ArmTvTech for more informations.